This blog post is an entry into the Foodies100/GLORIOUS! soup #GloriousAdventures blogger challenge, inspired by GLORIOUS! soup’s delicious Mexican tomato and fire roasted pepper soup. You can visit their website to find out more about their amazing gluten free range here and find out more about the Foodies100 competition here. There’s something about Mexican cuisine which screams adventure. It is stories shared around a close-knit group of friends, the fiery tastes as smoky as the dying beach campfire. At least, this is the image conjured in my mind when I first fell in love with Mexican food. It started with a tortilla – the simplest of things. Tortillas at home in England are often packed with unnecessary wheat flour, but here in Tulum, Mexico, they are made as tradition dictates, with corn. A simple recipe of corn flour and water is formed into a dough, flattened and fried swiftly in a hot pan. These tortillas are then wrapped in a tea towel – like a precious gift, and proffered to hungry guests, who hungrily fill them with dazzling colours and flavours. Who could have thought this simple staple could provide such a delicious experience? Smoky and fiery like the flames used to cook the tortillas, Mexican flavours are big, bold and beautiful. Tangy salsas of juicy tomatoes and onion with a squeeze of lime and bursts of coriander in your mouth marry up with the warming, comfort of refried beans. And then there is the soup – tangy tomatoes with a kick of spice, paired with crunchy tortillas, melting cheese and chunks of avocado. It reminds me of the GLORIOUS! Foods Mexican tomato and fire roasted pepper soup I enjoy so much at home – a handy gluten free go-to for a quick and simple lunch. Mexican paradise – the cenotes. 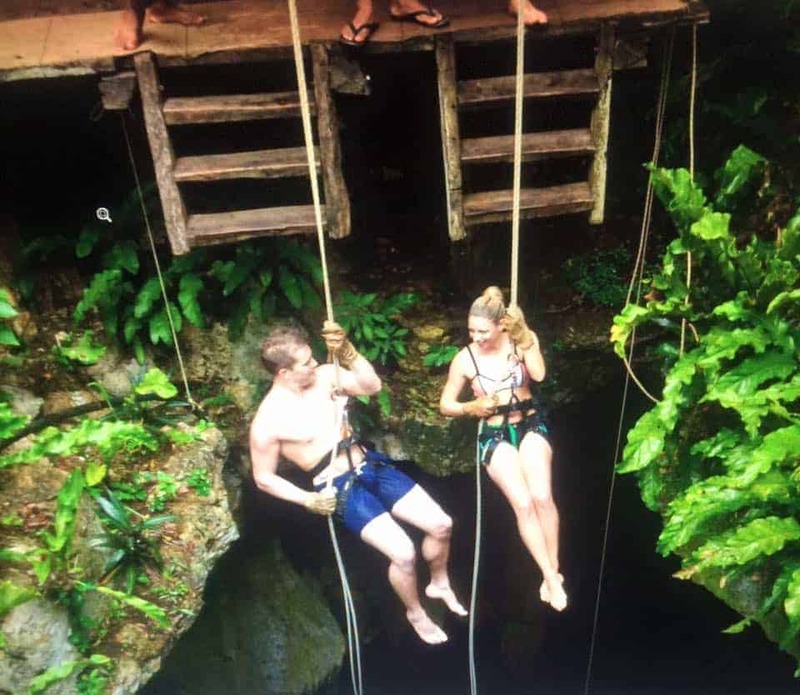 On our trip to one of Mexico’s biggest cenotes was where my love of adventure met my love of food – and created an incredible experience; one I will remember forever. Looking down through this tree-lined hole in the earth took my breath away. Under my feet was a huge underground cavern, discovered only when part of the limestone ceiling I was stood on caved away, revealing this geological wonder – believed by the Mayans to be the gateway to the underworld. Nervously I stepped towards the edge and peered down the drop into what seemed like a blackness, with only a glimmer of the underground river below. There was no going back. I turned, took a deep breath, and leant backwards. Far from the dizzying fall my irrational side of my brain was expecting, instead the rope clipped to my belt held me fast – and we were off. The surge of adrenaline was incredible as I let the rappel slip through my soggy leather gloves, and I looked around me. As the light faded and my eyes adjusted, I could not believe the magnificent chamber I was descending into. And it was spectacular, spending a happy hour floating around this vast chamber in an old tyre (quite literally! ), zip lining into the cold water with a gasp, and marvelling at the small, strange fish which swim around blindly in the dark. It was hungry work, and as we ascended the rickety staircase to emerge in the jungle, I breathed in the humid air and headed towards a small, thatched palapa for our lunch. The sauces lay before me like traffic lights, catching my eye first as I peeled several fresh, steaming tortillas onto my plate from the pile; reds, yellows and greens bursting with flavour. But be warned – the salsa verde might look fresh and inviting but here it packs a punch! A combination of tomatillos (where it gets its green flavour), onion and serrano chillies makes this the mightiest of flavours to add to your tacos! Paired with the cooling sensation of sour cream, slathered on tortillas so thick it dribbles down your chin, it’s a worthy combination – and the burning is addictive. But my favourite part was yet to come – the guacamole. Unlike the flavourless, hard avocados at home, there is nothing quite like eating this amazing fruit in the country it was grown. Fat, green avocados are smashed – quite literally – with red onion, tomatoes and, again my favourite of all herbs, fresh coriander. Not a feeble paste like in the supermarket, this guacamole is meaty, flavoursome, and quite incredible. I scooped up as much as I could! Before too long it was time to leave this beautiful jungle, so untouched by human hands for many thousands of years before it became this mecca for those so keen to follow their sense of adventure. It’s going to be a hard job to return back home – but nothing a hot, steaming mug of soup won’t sort. If I close my eyes, I can just hear the lively noise of the Mexican jungle, calling me back to my next adventure…. *NB: Apologies for the lack of pictures – Mexican internet does not like them very much! More to come on my trip when I return!